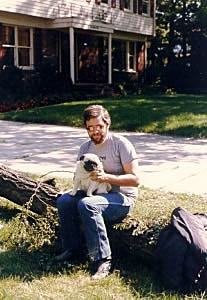 With Puggie dying on a Sunday night the search for another Pug began early the next morning. 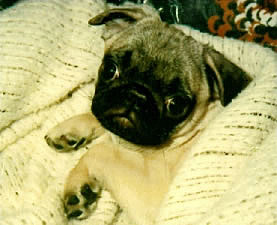 Our first phone call was to the Puggie's breeder in Oklahoma. 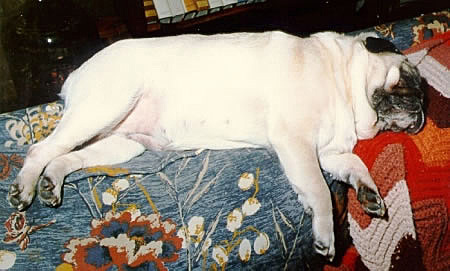 We thought since she was such a good and faithful dog, that if we could get another with the same, or similar, blood lines it would be good. Unfortunately they were no longer in the breeding business. 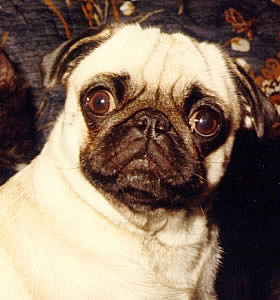 Subsequent calls to local pet shops and breeders revealed that there were no Pugs in the immediate area to be had. 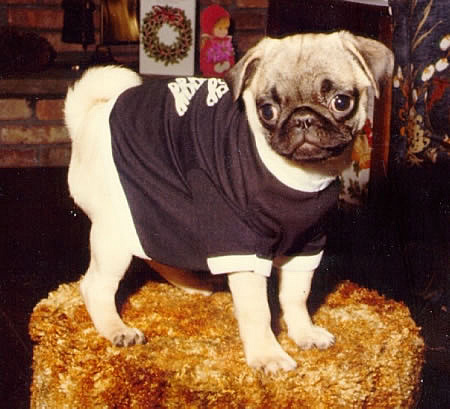 Through another breeder out west we got the name of a woman in Towson, Maryland who bred Pugs. We called and, happily, she had a litter with two puppies left to claim, a male and a female. We expressed our desire to purchase the female and made arrangements to drive down the next evening to pick her up. After work Anne, Jeannette and I jumped into the car and made the 240-mile drive to Towson. 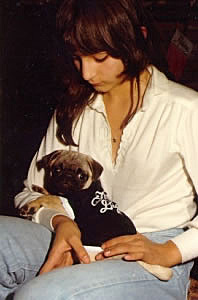 We knew that no other dog, Pug or not, could ever replace Puggie's place in our hearts, but we were lost without her underfoot. We had no choice but to find another and find it quickly. 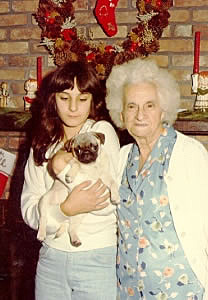 We worried, of course, that she wouldn't be as good, but we were determined to get another Pug into the family as quickly as possible. On arriving in Towson our fears were immediately eliminated with just one look of those beautiful, big brown eyes that she, who would later be named "Missy," gave us. She was playful and eager to climb all over us. 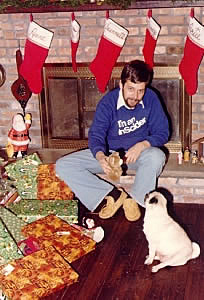 It felt good once again to feel and know the love that could be yours by a faithful and devoted Pug. Paying the breeder's fee we packed up and headed home. Missy laying alternately in each of our laps throughout the five hour drive. Missy would quickly and totally endear herself to us all. She was playful and a bit mischievous. She loved to chase toys thrown across the room and return them to you to throw again. 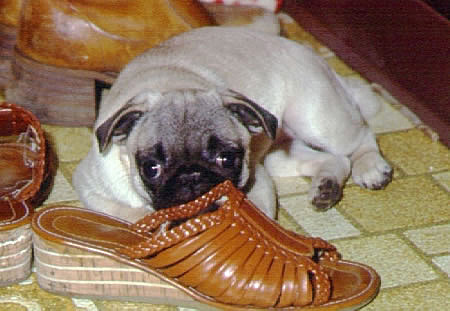 Shoes, of course, were her favorite chew toys and always a good place to take a nap. She had no fear of heights and would jump great distances when she was playing. It scared us at times how daring she was, but we managed to keep a close eye on her exploits. "I'm ready to jump. Are you watching?" Missy would bring a joy to the family that we had not known before when we bred her and she produced three beautiful little puppies (see the puppy's page). 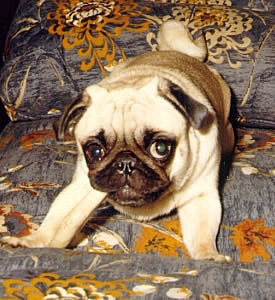 Standing up to the "Big Fella"
Missy was a good Pug and we enjoyed her for ten years. 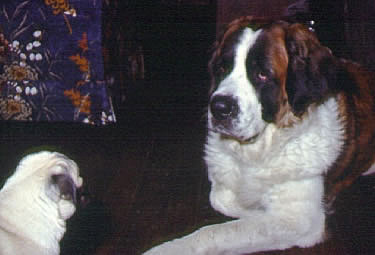 When she died in 1989 she left a part of herself in her two surviving puppies, Beau and Chrisy.